How long does it take to launch an innovative new feature on a newspaper site? About 48 hours — that’s the standard set by innovative editors like Jack Lail at Knoxnews.com, Tom Meagher at Herald News, and Mark Briggs at Thenewstribune.com. About two weeks ago, I emailed Jack Lail with the seed of what became the Publish2 Election News Network. We brainstormed by phone on Tuesday afternoon about using Publish2 to aggregated primary election news headlines from around Tennessee and around the web and publish them on Knoxnews.com. The primary was a week away at that point, but Jack said let’s do it. He had also hatched a plan to get some bloggers in the Knoxville Blogger Network, which Knoxnews.com publishes, to pitch in with the journalists. In less than 8 hours, we had not only an experiment in news aggregation but a pro-am networked journalism experiment as well. The next day, with the help of Knoxnews.com reporter and blogger Mike Silence, they rounded up a team and got them registered and set up on Publish2. Jack had a great instinct for keeping it simple enough for everyone to easily and quickly understand — he called it a “group link blog,” which is exactly what is was. Elapsed time — about 48 hours. “Experiment” has not traditionally been part of the print publishing vocabulary, where the costs to try something and the costs of failure are great. But now, as Dave Cohn tirelessly points out, “Trying stuff is cheaper than deciding whether to try it,” i.e. the costs of deciding whether to experiment — and missing opportunities — is actually greater than experimenting and failing. An example of a simple one-time use of the publish2 bookmarking system. 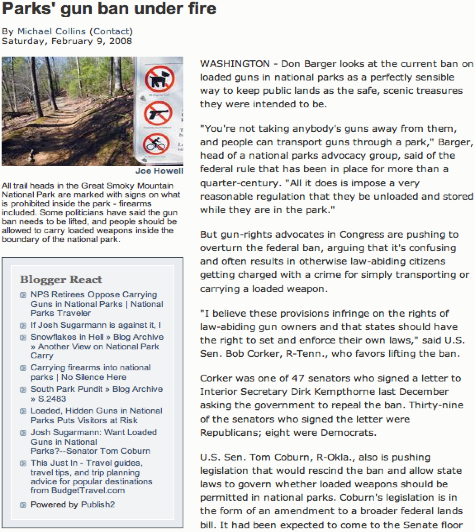 I searched around blogsearch.google.com and some other sources and bookmarked a few links with a “parkguns” tag and reformatted the rss feed with a modified version of the perl script I used for the election headlines. Quickly, I had a “react” block of headlines I could add to the story. Jack didn’t call a committee meeting to debate whether this might be a good idea — he just did it. And now he has a great example to show editors and reporters. Leading by example is essential to rapid innovation — it’s so much more powerful to see what something actually looks like than to speculate on what it MIGHT look like. The images in this post and the links to live examples are far more useful than any of my exposition. 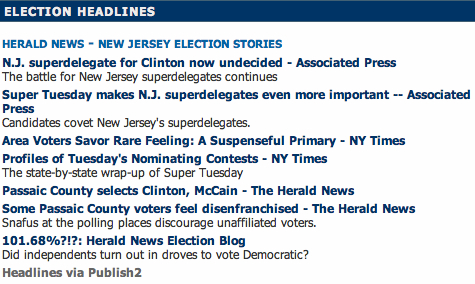 I saw a similar rapid turnaround last week from Tom Meagher, the city editor at the Herald News in New Jersey. Yoni Greenbaum mentioned the Publish2 Election News Network to Tom on the Thursday before Super Tuesday. I followed up with Tom on Friday. On Monday, he wrote me back saying he and some other folks at Herald News had registered for Publish2 and wanted to get started. 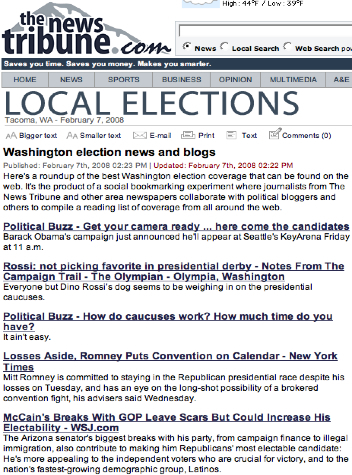 Yeah, we bookmarked some things to share with the 2008 Election topic group that we didn’t need to tag for our feed. That is, stuff we produced that we thought was cool and others in the ENN might be interested in. But I didn’t tell Herald News to do this — by experimenting with the network, an innovative approach to distribution suddenly became evident. But they never would have discovered it if they hadn’t tried it. Without experimentation, there’s no discovery. Of course, Mark literally wrote the book on Journalism 2.0, but he sure does practice what he preaches. Here’s a roundup of the best Washington election coverage that can be found on the web. It’s the product of a social bookmarking experiment where journalists from The News Tribune and other area newspapers collaborate with political bloggers and others to compile a reading list of coverage from all around the web. All of the examples above are still works in progress — as Mark openly admits in his post — the aim is not to succeed overnight, but to decide overnight to start experimenting and learning. Many news organizations still approach innovation based on planning and development cycles measured in months (or longer), when the time frame should be measured in days or weeks. On the web, with cost of technology so low (or, in the case of Publish2, free), innovation can happen very fast and very cheap simply by TRYING. The news business — and the journalism it supports — can no longer afford to wait for innovation to happen in due time. It needs to happen NOW. Fortunately, there are plenty of innovators like Jack, Tom, and Mark leading the way, and the threshold for trying something new is getting lower everyday — even as the imperative to do so gets higher. If you’re interested in being part of the Publish2 Election News Network — or using Publish2 for any other news aggregation experiment — email me at scott.karp at publish2 dot com. We’ll have you up and running in 48 hours. Or less. You can register for Publish2 here.